The author proposes a novel concept of "the paracommons", through which the savings of increased resource efficiency can be viewed. In effect he asks; "who gets the gain of an efficiency gain?" By reusing, economising and avoiding losses, wastes and wastages, freed up resources are available for further use by four ‘destinations’; the same user, parties directly connected to that user, the wider economy or returned to the common pool. The paracommons is thus a commons of – and competition for – resources salvaged by changes to the efficiency of natural resource systems. The idea can be applied to a range of resources such as water, energy, forests and high-seas fisheries. 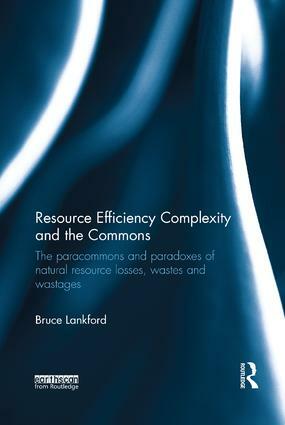 Five issues are explored: the complexity of resource use efficiency; the uncertainty of efficiency interventions and outcomes; destinations of freed up losses, wastes and wastages; implications for resource conservation; and the interconnectedness of users and systems brought about by efficiency changes. The book shows how these ideas put efficiency on a par with other dimensions of resource governance and sustainability such as equity, justice, resilience and access.